600 blue personnel under North Jakarta Water Resources Sub-dept. have been deployed to anticipate inundation in local areas.
" From sweeping results, we have mapped flood-prone areas. We optimize anticipation ways"
Jakarta Water Resources Sub-dept. Head, Teguh Hendrawan stated that various activities have been conducted since January 2018 in a bid to face rainy season this year. "From sweeping results, we have mapped flood-prone areas. We optimize anticipation ways," he expressed, after leading a readiness ceremony at the office of North Jakarta Mayor office, Jalan Yos Sudarso, Kebon Bawang Urban Village, Tanjung Priok Sub-district, Sunday (11/4). Meanwhile, North Jakarta Water Resources Sub-dept. Head, Santo added that one of area-prone areas in his office area is located at Jalan Yos Sudarso. 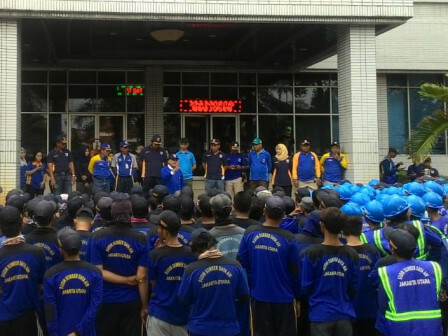 "Today we do cleaning towards waterways and drain water channels as long as three kilometers on Jalan Yos Sudarso from Sunter Boulevard area until Jalan Bugis," he stated.